"It's kind of hard to pitch something when you don't even know what it is!" Coldwood Interactive's Unravel has been getting some pretty favourable reviews recently, and the folks over at Gaming Bolt have popped the question that many Nintendo fans will want to know - could the title ever see the light of day on the NX? I wish I knew more about it, but they're really secretive about it. I actually had a really fun discussion with a person from Nintendo a while back. It was basically 'I'll show you mine, if you show me yours' (laughs). So he wanted me to pitch something for the NX, and then he could tell me more about what it was. But basically, it's kind of hard to pitch something when you don't even know what it is! So if you manage to guess it right, we'll tell you what it is. So, I don't know. But I am just as curious as everybody else to see what they've been making. While Nintendo has apparently issued dev kits to selected developers, the company has publicly remained tight-lipped about what form the system will actually take, leading to rampant speculation online and in the gaming press. It would seem that this level of secrecy isn't without its risk - Sahlin's comments suggest that it could be putting developers off pledging their support. Hopefully an official NX announcement will come soon so that Nintendo can be more open with the development community, and thereby attract more software support for its new console. Thanks to arslan for the tip! I always wonder why no one talks about Yoshi's Wooly World or the Kirby game when they talk about this game. Sometimes I think it's good that nintendo doesn't mention anything about the console...it builds a strong hype train, which in turn, could help it become a massive hit, especially if they end up releasing it this year (since the PS4 and XONE have basically gotten all of their sales). Other times, it's not the greatest idea to limit the amount of dev kits for the system, as it could mean a big gap in game releases for it's first year (something that they can't do when the other systems are pushing over 100 games already). I don't think nintendo is going to announce anything about the system until E3, but the hype train is growing on it...let's just hope that it's not going to be a big gimmicky machine that causes the hype to drop. I'm actually excited about it, but it all comes down to the cost, the price, the advertising and the sales. I love the Wii U, but I saw way more titles on the Gamecube itself (which was my personal choice and favorite console of that generation). I enjoyed the game on PS4, was a fun game to just play through in a few sittings. This would be awesome if it happened but it's not just the lack of knowing what the NX is which is a problem. EA published the game so a lot hinges on whether Nintendo and EA can do a deal come March to get their games onto the new platform. @JLPick That all depends on what the press and public consider to be a "gimmick". Everyone says they want a standard console with standard controls but at the same time want it to be a hybrid allowing games to be also played on the go. That right there could be considered a gimmick especially as the handheld part of the system would likely act as a controller to the home system part. What's wrong with the Wii U? It should be running on it fine. It is a knock off of Yoshi's Wooly World and Kirby's Epic Yarn. Hey if Pikmin 3 ran fine, then so would this game. Oh and I'm SOOOOOOO sick of seeing the letters NX!!!! That's certainly a beautiful looking game. Could this run on the Wii U nevermind the NX? Potential problem? EA. And Nintendo are too secretive for their own good, they need to open up if they want developers to be interested and also to have games ready for the NX's launch. It looks good but the Gameplay is kinda boring. Of course, Coldwood could ask their publisher for dev kits... but then, you remember it's EA, which makes the point rather moot. Nintendo have already 'woolified' Yoshi and Kirby. It now seems they just need to move onto Chibi-Robo and they'd get this. @MrGawain Sadly, because relatively few people are aware of those games, and even less have played them. As one critic said, releasing a great game on the Wii U is like hanging the Mona Lisa in some random home in Liverpool; hardly anyone's going to know about it, regardless of quality. Mario Kart 8 and Splatoon being the obvious exceptions in terms of mainstream acceptance. All aboard the hype train! Choo! Choo! @MrGawain Probably b/c it's on a Sony system and looks more like Little big Planet which came out 2 years before Kirbys Epic Yarn. People who talk about games on Sony systems rarely ever acknowledge Nintendo games, probably b/c of PSASBR being so bad, and MNR not being anywhere near as good as MK, though the level editor would be nice in MK9 using a touchscreen. If NX is to be released in 2016 then this seems like a problem to me, surely there are some developers already making games for the new console. @rjejr Oooooooooooooh! A MarioKart level editor! Like in Diddy Kong Racing! Omg that would be AMAZING. Especially with what we've seen Nintendo can do with a touch screen level editor (ex: Mario Maker) That could be what makes MarioKart 9 even better then 8! Surely he could of just pitched something to them and got a little idea about the device and then adapt the idea on the response. If NX will really be released soon, this sounds like a major problem and a possible cause of future software draught. I would buy and play this on a Nintendo System. Too bad Wii U dev kits cost so much, making it difficult for indies to get them and make content. I would recommend trying to port it to Wii U, because then you might be on Nintendo's good side and they might let you port it to the NX or the Wii U replacement might be backwards compatible opening up to more sales. We don't know anything about NX and I understand wanting the information to make your decisions on but sadly it won't happen until you have already left this project behind and started a new one. @rjejr: That is ridiculous. The Nindies run very well on the WiiU and Unravel is NOT a great game. It looks funny and atmospheric but it is just a boring game. And everybody knows: In Feb 2017 the NX won't have sold more units than the WiiU until now. It doesn't make any sense waiting for NX when one doesn't want his game on the WiiU. @Chandlero i believe is not so easy to port an 8th gen game to a 7th gen one with different architecture and limited power, being an indie... It also depends by the engine that has been used. @arnoldlayne83 I don't know how you are counting but WiiU is 8th Generation. You cannot argue with that. Of course, you can discuss the different power. However, I think the WiiU could handle the game but of course there is work to do. Of course he could already know exactly what NX is and is just playing the game so to speak. Clearly there will be a good few devs who already know what the plans for NX are and some of them will be indies too I'd imagine, shin'en for a start. It amazes me that concrete info never really seems to leak out about nintendo consoles before the official announcement. @KingofSaiyans Yeah I just said that because it was made out of yarn 😅😅 Nope haven't played it yet because waiting for a drop off in price on PS4. Thinking about it more and actually it kinda relates closer to LittleBigPlanet. @TheHeroOfTime333 Well don't get too excited, I was thinking more along the lines of the really lame level editor in SSB, not SMM. Still would be a nice selling point though, whatever it was. @Chandlero I really have no idea what you are talking about, maybe you meant to reply to somebody else? Maybe sligeach? @DefHalan Doesn't Nintendo pay for the dev kits for indie devs? @IceClimbers Not always. normally Devs have to buy Dev Kits themselves. They do have certain programs that make them more affordable but it is still a lot to spend on a system that everyone is things is going to be replaced in a few months. @MrGawain Have you played Unravel? I have and other than the fact that Yarny is made from yarn the mechanics have nothing to do with Yoshi's Woolly World or Kirby. So there's not really much to talk about. @DefHalan Interesting. Might as well make the dev kits free now. @IceClimbers Well Dev Kits still take a lot of money to make. It might be beneficial for Nintendo to offer discounts for future Dev Kits by "trading-in" your Wii U Dev Kit or something but at this point, how much would that matter? There is still a lot of unknown information about current and future systems. @rjejr I am very sorry. You are right. It was the answer for @JohnnyC. My fault. @andrea987 Nintendo us in a tricky situation regarding releasing the NX. Release the platform in 2016 and there may not be enough launch titles from third parties and across the first year. However, launch fall 2017 and it's potentially too late as the Xbox One and PS4 will be 4 years old and likely talk of the next systems will be soon to follow. I'd like to give it a try, sure. Likely won't top Woolly World for me as best woolly-style game though, but that's okay; not much can top Wooly World for me anyway. I'm playing the game right now on PS4 and it is awesome. It plays like a platformer but it's much more focused on very clever puzzles. @MrGawain why would they? They're completely different games. Just because they both have fabric based character in them? That is the only connection. LittleBigPlanet has a fabric character starring too, as technically did Glover. None of the games are alike though. That's why nobody brings them up, there's no need. @DefHalan EA published the game, so it's not as if they have much of a choice. It's only getting ported to a Nintendo system if EA wants it. @DefHalan Not sure what their relationship with EA is with this game, but it's possible that EA provided the dev kits for ColdWood Interactive in the first place; for PS4, XboxOne and PC. I think they're better off asking EA for a Wii U port. @FragRed Tricky indeed. The recIpe is: 1) SECURE main third party games for ALL the console lifecycle; 2) AS MANY first party games at launch, even if they have to be ports; and -more importantly- 3) MARKETING, MARKETING, and more MARKETING. Pointless article. The only reason this game got as much attention as it did, was because of the nervous guy on the stage who introduced the game to the world. Looks nice, but nothing about it is really new, we've played it all before. I'm surprised to come in here and see people aren't swooning over his "adorable comment" on how he doesn't know about the NX. More than enough people don't know about the NX who are devs, did we really need to report on this? Unravel is a fantastic game. It's a shame it's not on a Nintendo platform. It has the "feel" of a Nintendo game. This and Ori and the Blind Forest. 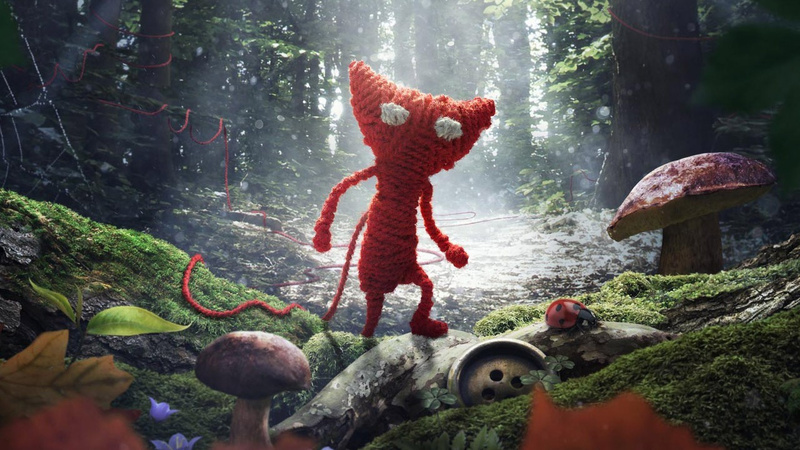 Unravel looks awesome, so its welcome! @Chandlero Sorry, reading back it looks like I'm saying Unravel is a great game. I agree, it isn't. I was just making a point that when even very good games struggle to do much business on the Wii U, and there haven't been any Nindie success stories on the scale of Journey or Rocket League on the Wii U, it's understandable why some developers are dodging the Wii U. One of the best indies I've played on the Wii U is probably Scram Kitty, and even that jumped ship to Sony after a few months to try and find a wider audience. It's the sad but true reality of the Wii U's situation, and while it's not what we as Wii U owners want it is understandable why software developers often avoid the console. If Fifa 13 and Black Ops II couldn't sell when they released at launch, what chance do other titles have? Part of the blame for this lies in Nintendo's established position for many gamers as being a second console, which is something that's come about over time. To this day I'm not sure why Nintendo didn't use their war chest from the Wii and DS to just buy Activision outright, or some other major studio. Not like they couldn't afford it, and it would have put the Wii U firmly in the race for this generation with more titles that have broader appeal than their current catalogue.